Alasdair Finch has brought his brother back from the dead. Alasdair and Oliver lived their lives in hiding as Shadow Boys, using clockwork to repair men who had lost limbs during the war. But when Oliver dies tragically, Alasdair believes he can attempt the impossible. He tries using clockwork to bring Oliver back from the dead, and he succeeds - with consequences. Oliver is not the same, and now Alasdair is tied to Geneva to care for him, his dreams of going to school crushed. Until Frankenstein is published, and the city goes on a rampage to find the real Dr. Frankenstein and his monster. This. Book. Was. So. Good. It has been sitting on my shelf for a while now, and I have been trying to save it to read during the fall. I read it during Halloween time this year, and it was an absolutely perfect read. There were so many wonderfully amazing things about this book. It might become one that I read over and over again. The characters were perfect. Alasdair and Oliver's relationship was beautiful, even through their more trying times. Even the smaller side characters were given such distinct personalities. It made the story so vibrant. What I personally loved was that there was no real romance in the book. Alasdair was hung up on an old love, Mary, but it was a small detail of the story and didn't distract from the main plot line. My absolute favorite part of This Monstrous Thing was the historical fantasy aspect. I adored the way the story took the classic of Frankenstein and turned it on its head. It was both a retelling of the original and an explanation of the story's origins. I was completely fascinated by the world that Mackenzi created, and I want to spend more time there. It is always fascinating to learn what an author's motivations were for their book, so it was so cool to see an interpretation of how Frankenstein was born. One aspect that I found really interesting was how much trouble the publication of Frankenstein caused. I couldn't believe how the people reacted to the book, saying that it destroyed lives. I kept thinking to myself that it's just a book. How could they be making such a big deal out of it? How could they read this work of fiction and believe so whole-heartedly that it was real? Then I remembered all the times that books have caused a stir in real life. When I was younger, my parents put me in Catholic school. When The da Vinci Code was released, I heard so many lectures about how it was sacrilegious to even pick it up and read it. It amazes me what a book can do in our world. It was so much fun reading Mackenzi's interpretation of the commotion Frankenstein would have caused in her world. This book covers so many genres and interests that a wide variety of readers can enjoy it. 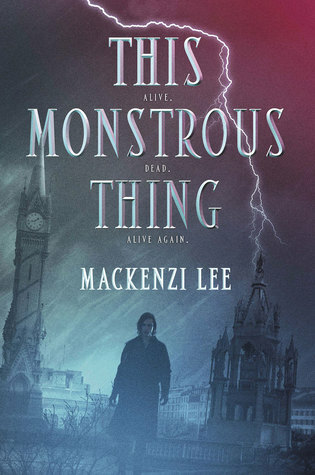 If you like history, literature, steampunk stories, or retellings, you will love This Monstrous Thing. It made me want to learn more about Mary Shelley, Frankenstein, and Europe in the early 19th century. I can't recommend this book enough. I hope you decide to pick it up. I'm off to do some research.